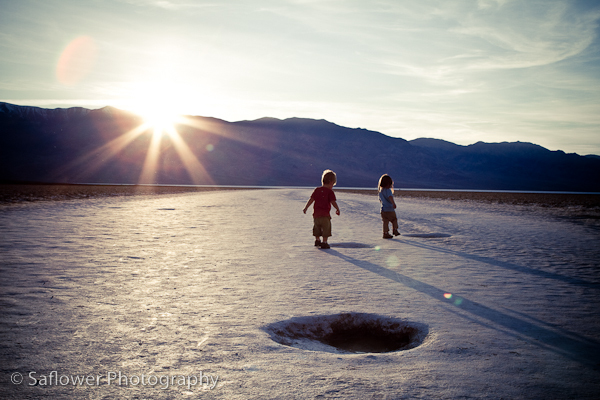 For as long as I can remember, every spring break since I was about 2 years old has been spent in Death Valley. Sure, there have been years when I had to miss due to Mexico trips or school, but for the most part, I have gone every year for as long as I can remember. This year was really exciting for me because it was the first year the twins got to go! As excited as I was about the kids going camping for the first time, it was a little sad because Pat had to work and wasn’t able to come with us. Instead of Pat, I had a replacement spouse for the trip. My best friend from childhood, Coral, rode shotgun in my car and kept the kids company on the super long drive. She was awesome and it was just like old times when she would go with our family to Death Valley, except this time we were in the front seats and not the back seats. I think I’m going to break this down by day. It will be easier for me to actually remember everything that way. Ok, so since Pat was on travel the week before we left I decided to head up to Lockwood a few days before the trip and leave from there so I wasn’t driving to the desert alone. On Saturday (The day before we left), Jane, my MIL, and Coral, my BFF, headed to Lockwood so we could go to the Dutch Oven Event that was put on to raise money for the Nacitone Regional Interpretive Center. 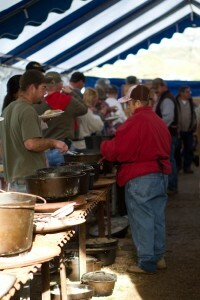 There were a ton of cooks there all using dutch ovens to prepare amazing dishes. The chuck wagon that my dad has been working on was also there and it looked great! During this outdoors event, it just happened to be pouring down rain. The kids thought it was the greatest thing ever (until they got to the desert). I don’t think there was a single puddle there that they didn’t splash in. By the time we headed back to my parents house, both kids were soaking wet with huge smiles on their faces. When we go back to the house we just hung out with the kids and finished packing and loading the cars. The plan was that we were all going to go to bed early since we had planned on leaving at 7 the next morning. I’m not one for plans, so of course Coral and I stayed up late talking and catching up. Normally we do back country camping. Basically we just drive down a road until we find a good place to set up camp. This year we stayed at the actual campground instead. We wanted to have access to water and the store and the main road because of the kids. Soooo, we finally get the the campground and start setting up. 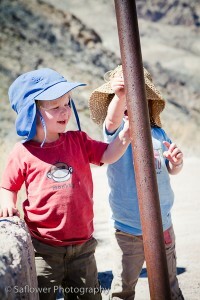 The kids totally loved playing in the dirt and running around screaming while we tried setting up. I got a new 10 person tent, so Coral and I had to figure out how to set this monstrosity up. It was actually pretty easy. Once it was up, it was obvious this thing was more like a castle than a little tent. When the kids realized they got to sleep on an air mattress, they broke it in by jumping all over it. Once it was broken in to their satisfaction, it was bed time. 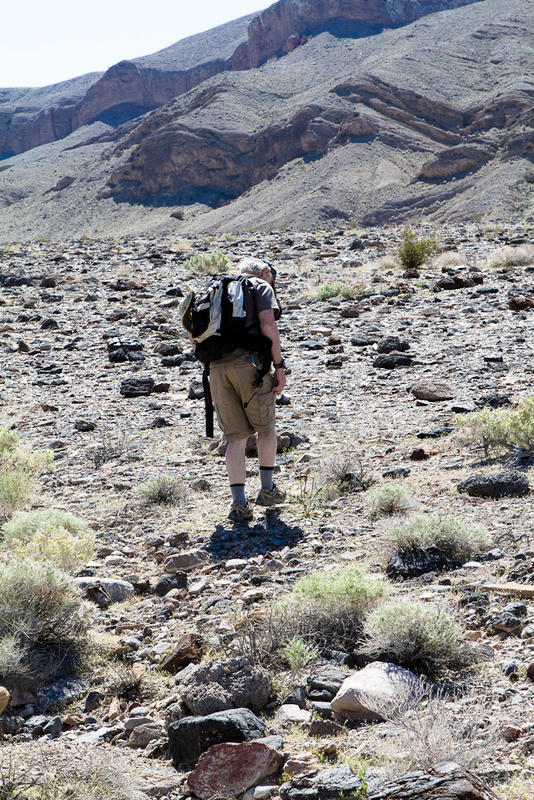 Day 2 – If you have ever gone anywhere with my dad, you know how he is on a hike. He has a general idea of what he wants to see, and that is all. So, we went on a little hike to find a rock. No, I am not kidding. 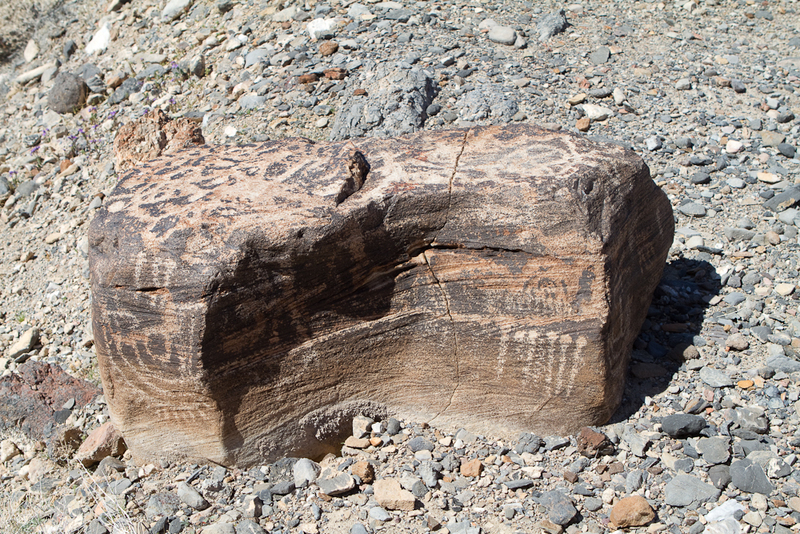 It was a rock with some petroglyphs on it and it was literally in a Vast area full of almost identical rocks. 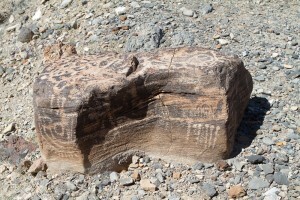 Somehow, we managed to find this rock and a couple others that were just like it. I think we ended up walking for just over a mile and the kids did great! Ella kept picking up rocks and putting them in her pocket. When she ran out of room, she started putting them in Jackson’s pockets and my pockets. It was really cute. On a side note, when I got home and started doing laundry, I kept finding rocks in the washer. After the rock hike, my dad and some of the other people went off and did another more intense hike. Since I had the kiddos, we headed to the store and got some ice cream then washed up back at camp in a sink that was on the backside of the bathroom. 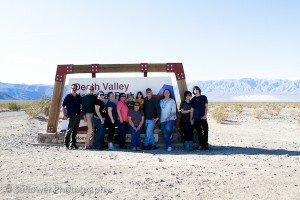 Day 3 – There are certain things that are pretty predictable about a desert trip, especially if there are new people going. 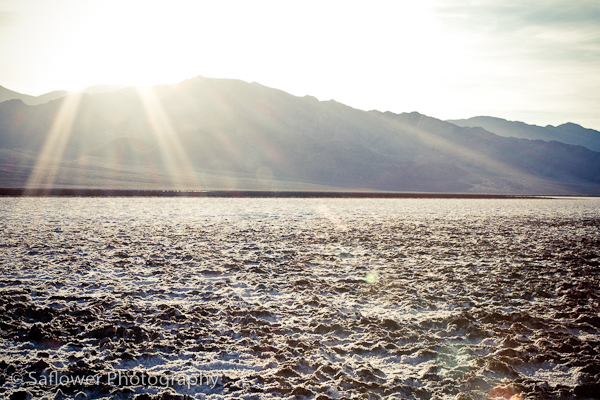 One of those things is a drive to Inyo Mine. 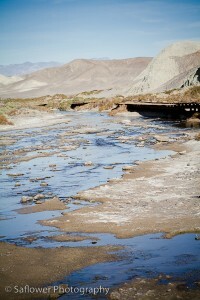 Now, Inyo is probably one of the coolest places ever! You can take a short, but steep hike up a hill to the actual mine and unlike other mine shafts, this one is not covered. As long as you have a good flashlight you can go in and explore. There are places you have to be very careful because there are air shafts that go straight down. We have even seen people there with climbing equipment that were exploring the other levels. How cool would that be? Did I hike up to the mine shaft? Nope. I have seen it about a million times and I didn’t want the kids up there. Instead I stayed below with the grandmas and Coral. 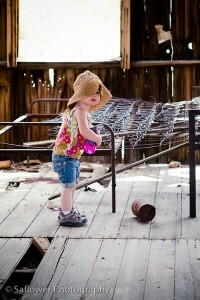 I took a ton of photos and showed the kids all the cool old buildings. Ella really liked the one that I call the sunburst building. We had lunch and played with trucks and shovels while we waited for the others to come down. Once they got down, my dad informed us they were going to go up the road and look for more Indian crap. Soooo, we headed back to camp. Once we got back to camp we had to find a way to stay cool. It was about 100 degrees and we didn’t have any shade. We found a little area under a tree but the kids wanted no part of it. Instead, Ella went and made dirt angles and Jack played with his trucks out in the sun. They got a little red. I think we had a camp fire that night, but I don’t really remember. Day 4 – So, this was our “cool off” day. It started off super early with everyone except Coral, the kids, and myself doing the Golden Canyon Hike. Since we didn’t want to sit in the camp site and wait for them, we took off and went to the Salt Creek boardwalk to see the pupfish. The kids had a blast running up and down the boardwalk. I was glad they didn’t try bringing a fish back. It started to get super hot so what do you do? You go to the store and get ice cream and beer, of course. After we finished up it was time for me to pick up the hikers. 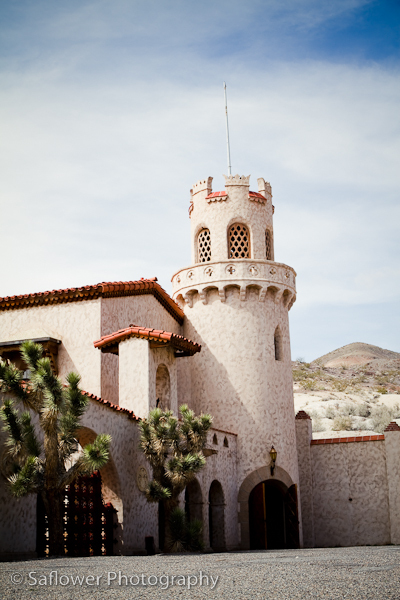 Since it was ridiculously hot, we headed to Scotty’s Castle which is at 3000 feet elevation. It was nice and cool up there. Everyone did the tours except myself, the kids, and Grandma Jane. 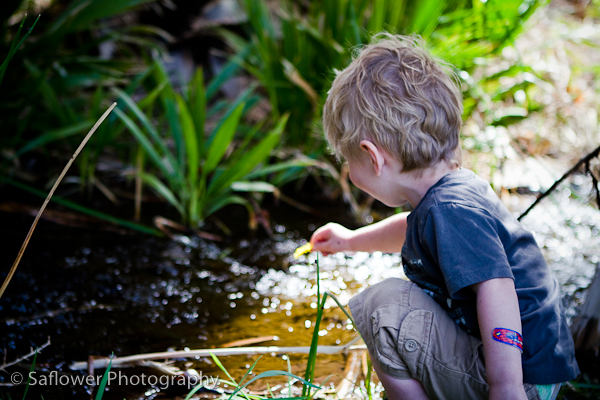 We hung out on the lawn and let the kids throw leaves in the little stream and watch them float away. They had soooooooo much fun! They loved dropping the leaves in and running downstream to wait for them. We were there for awhile because the weather was nice. We got back to camp and decided it was shower day! The store has a pool and shower that are open to the public if you buy a ticket, but if you go during the down time, no one is there checking tickets. Ella screamed through the shower so that everyone in the pool could hear her! She was not a happy camper. After we were nice and clean we went to the saloon and had pizza and beer. Yum! Day 5 – Again, predictability played apart in the days activities. 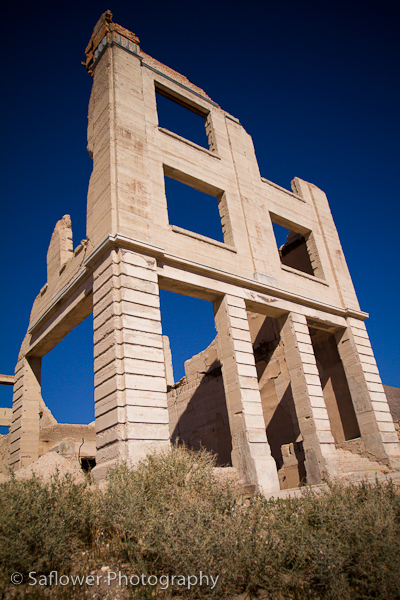 I actually got to choose what we did, so I picked Rhyolite and Titus canyon. Yes, we do this every year, but there is always something new to discover here for me. Usually I find something new to take a picture of, but this year it was fun watching the kids run around the ghost town and play in the old buildings. 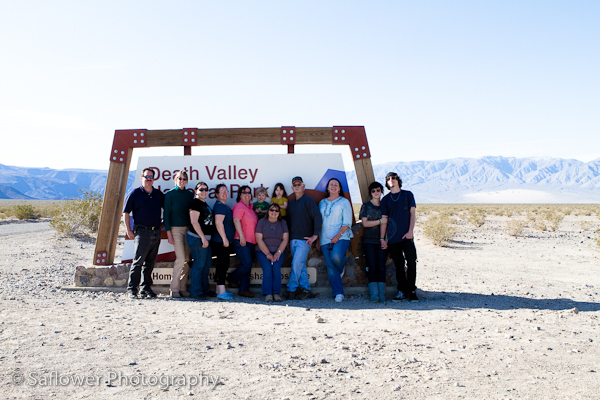 While we were here we ended up doing a little mini session photo shoot. 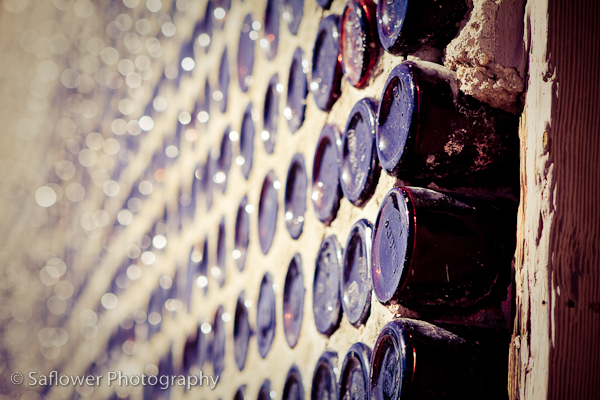 Part of Rhyolite is the Bottle House. It is a house made out of a gazillion bottles, but in 2005 they did some restoration work on it and now it has pretty much lost it’s appeal. I hate when they take and old building that has character and paint it with new paint. At least the kids liked it. After we left, we headed into Beatty, NV to get some gas and lunch, then headed to Titus Canyon. Titus is a one way canyon that actually involves some 4-wheel drive. It takes a couple of hours, but it’s totally worth it. About halfway through the canyon there is an old mining town called Leadfield. We went exploring and the kids discovered how to bang rocks on the metal pipes to make super loud “music.” After our explorations, we headed down the road. The narrows were just amazing and the kids kept looking up saying, “Wow.” Once we got out of the canyon we got tired of waiting for the other people so we took off and did our own thing. At first we headed to the store and got more ice cream of course then we headed back to camp but it was way too hot! We went over to the little picnic area by the store and it was nice and “cool.” We stayed there for awhile and the kids worked on their Jr. Ranger books so they could earn their badges. After we got tired of sitting there we went and did the Artist’s Palette drive and went out to Devil’s Golf Course so I could take some photos with the nice evening light. 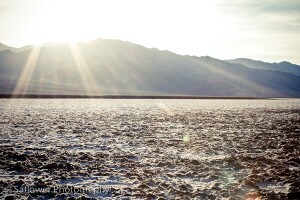 After that we raced down to Badwater to catch the sunset. 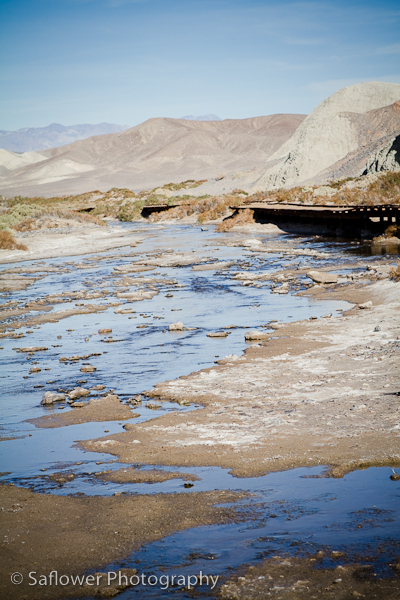 Now the kids can say they have been at the lowest point in North America. I got some cool photos then headed back to camp for dinner since I had two very hungry and very tired kiddos. Day 6 – This was our pack up and head home day. Our castle was pretty easy to take down once we got it all cleaned out. Somehow, my car ended up much fuller this time around or maybe I just didn’t pack it right. Once we got everything loaded up, we went over to the visitor center and the kids got their Jr. Ranger badges. After that we headed home! It was a pretty uneventful trip until we hit Tehachapi. There was an accident on the other side of the freeway and there was a helicopter sitting on the freeway. Jack thought it was just the coolest thing ever. After that we made it home and the unpacking began. That was pretty much our whole trip. I really hope next year Pat can go with us. This summer we want to take a camping trip on our own.